Last night was one of the most proud moments of my life. I had my first rehearsal with my full cast of the play I wrote, “Those Days” and I couldn’t be happier with the people who are acting in my first play. Granted at the same time in New York, my other cast is rehearsing for “Raincoat”, but I don’t have much pull over there, and can only hope that it’s going well. With “Those Days”, I am watching my play slowly take shape, from a simple Word document to a full-fledged production with live actors. To have someone read and memorize the words you’ve written is akin to the feeling a singer must have when they see people in the front row sing their lyrics. I’m pretty stoked about it. But because I’m directing a play, writing and acting in another play, acting in a third play, and working as much as I can, my blog has had to take the back seat this past week. Even my novel, which is progressing, by the way, has been a bit neglected due to my lack of free time. But, because it’s tradition, I figured I can’t just ignore writing a Triple Shot. I only have about 25 minutes to do so, so brace yourself. I’m not one for biopics. Personally I think directors cram them too full of fact and forget about the characters themselves. The two other biopics I enjoy are “Frida” and “La Vie En Rose”, which I absolutely fell in love with. While I don’t put “Che” on the level of those two beautiful films, I enjoyed it quite a bit. Before watching the film I didn’t know much about Che Guevera. I recognized his face on t-shirts and I knew there was some debate whether wearing one was “anti-American” or not. But now that I’ve seen this 4-hour film starring Benicio Del Toro, I finally understand what it’s all about. Not that I’m ready to put on a shirt or anything. The film is split in half, “The Argentinian” and “The Guerrilla”, and personally I enjoyed the first more so than the second. 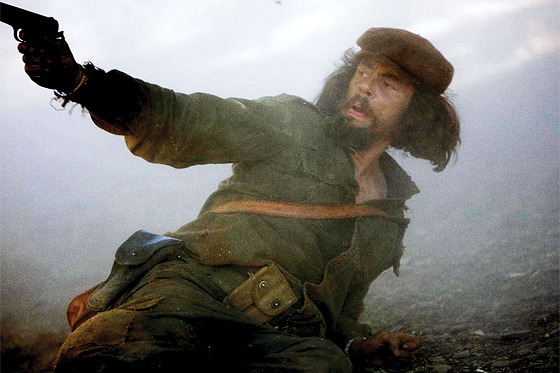 The first part details the struggle of the Cuban Revolution, while part two explains Che’s attempt to rectify Bolivia using the same methods, which eventually led to his capture and execution. If you don’t know much about Fidel Castro or Che, I would recommend watching the film. Otherwise if revolution/war films aren’t your thing, I say you watch The Imaginarium of Dr. Parnassus instead, which is also quite good. Stephen King is just not my kind of writer. I’ve only been able to finish one of his books before, “Under the Dome” and that’s because I just wanted to know how the eff it was going to end. Recently I’ve decided to try and tackle the seven-volume “Dark Tower” series beginning with “The Gunsliner”. Now, “The Gunslinger” is a book I’ve read four times and finished once. I could just never get through it. It’s poorly written and jumps all over the place. When I did finish it (yesterday) I moved on to the second book, “The Drawing of the Three” and finally the story is beginning to take form and I’m really enjoying it. The series details Roland of Gilead’s treck across multiple universes and an ever-expanding desert to reach The Tower. At this point I don’t know too much about him, nor do I know why he’s heading towards the Tower in the first place. But I’m beginning to get sucked in. I haven’t read any Fantasy novels since I finished “Harry Potter and the Deathly Hallows” so I’m finally getting back into that way of thinking. I just hope the rest of the series will be as good. Of the many jobs I currently have, one of which involves me sitting in front of a computer. There are moments when the day begins to drag on and I begin surfing the web. One website that I’ve recently come across is www.slashfilm.com and it’s FANTASTIC! Being the dorky movie geek that I am, it offers the most up-to-date movie news that I can currently find. They list new films in production and the cast members the films have recently assembled. It also helped me find those “LOST” shirts that I advertised on my last blog. (Disclaimer: When I post things like this, I’m not getting paid by the website/product manufacturer. I just think they’re cool and want you to know about them too. If I did get paid though, I would love it! Take note.) So if you’re ever feeling bored online, check out /Film. It’s pretty darn cool. Phew. That was quicker than I expected to write. Now I have a little free time to shower and eat. I guess “It’s Always Sunny in Philadelphia” just arrived in the mail, so I’m probably going to start that later today. Hope it’s good. Later readers!